Oct. 31. 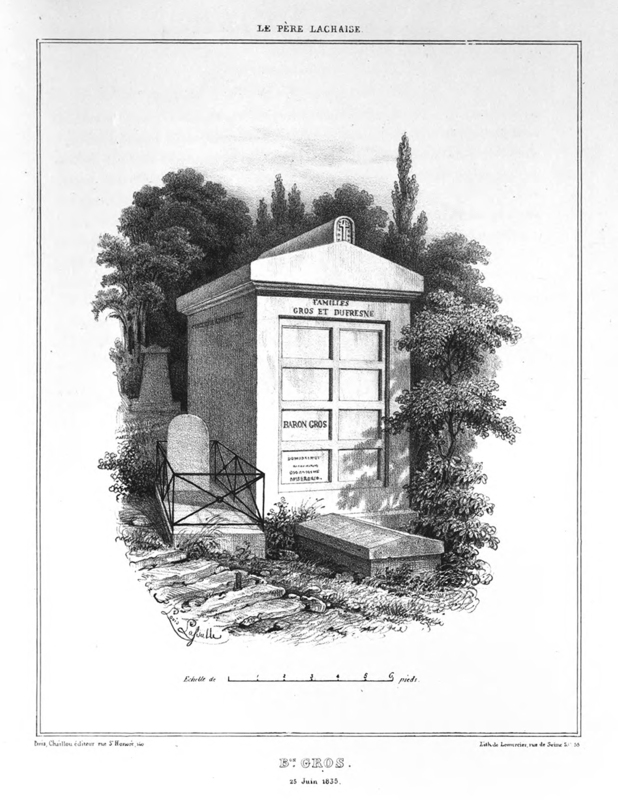 Visited Pere la Chaise, which, apart from the fact of its having been the first city cemetery beyond the churchyard burial places in the midst of the population, and its affording a noble view of Paris, possesses less interest than most cemeteries. 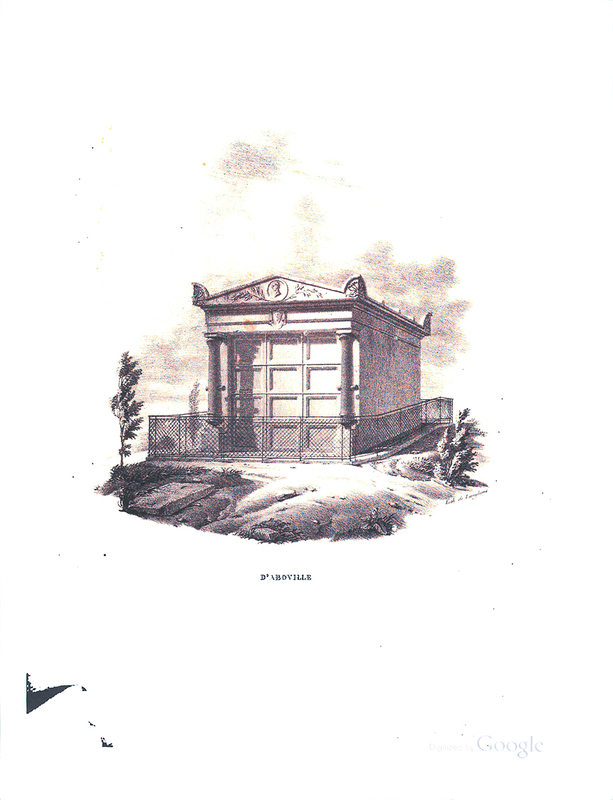 The largest and most elaborate of the monuments is that of the Russian princess Demidoff; the one most worthy of a pilgrimage is the small temple, where lie side by side, unworthy conjunction, the effigies of Abelard and the unhappy Heloise. Most of the monuments consist of small chapels, like boxes, in close contiguity, within which are hung garlands of immortelles, and sometimes of beads. Sometimes beautiful natural flowers stand in pots upon the little altar, and more frequently bouquets of artificial flowers supply their place. The French taste is, for many reasons, more successful in behalf of the living than of the dead, and the cemetery is a stiff one. The most touching of all the resting places, to me, was a small plot, enclosed by an iron railing, with a hedge - without monument or inscription. By careful inspection one finds, rudely scratched upon the gate, as if by the point of a nail-Ney. It is a text for a volume of sermons. We looked into the Jews' burial ground, which seems beautifully kept, with a quiet, un-Frenchy seclusion-the monument of Rachel is near its entrance. 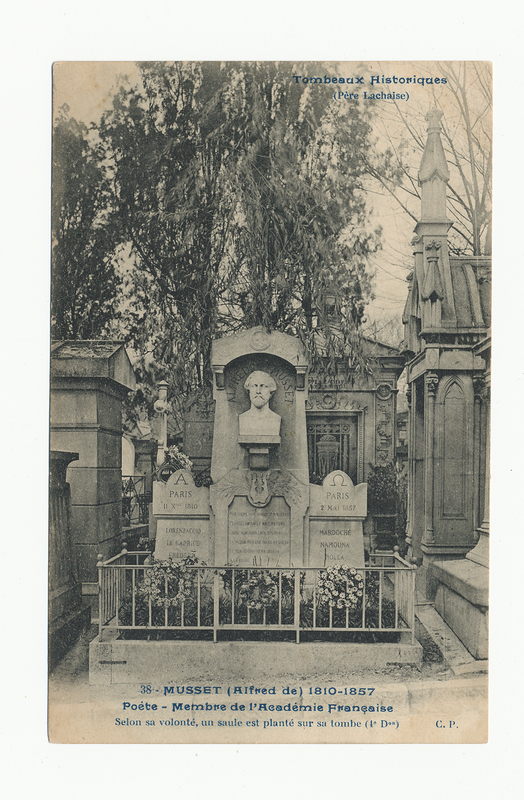 We saw the tombs of various French authors, and the statue of Casimir Perier, but found an hour or two in the streets of the necropolis a sufficient type of the whole. Sit back, listen to this quiet piano and imagine you're strolling the chemins of Pere-Lachaise, alone, at peace. I am half disposed to admit the assertion of a lively authoress, that the French are a grave people, and absolutely determined upon contradicting the received opinion in England, that in the volatility of their character their sympathies, however easily excited, are generally evanescent; and that the claims of kindred or friendship, so far from awakening any permanent sensibility, are quickly superseded by the paramount dominion of frivolity and amusement. Let any man who is laboring under this mistaken impression pay a visit to the Cemetery of Pere La Chaise; and if he do not hate France more than falsehood, he will admit that in the precincts of this beautiful and affecting spot there is not only a more striking assemblage of tasteful decoration and appropriate monumental sculpture, but more pervading evidences of deep, lingering, heart-rending affection for the dead than could be paralleled in England or any other country of Europe. The tombs elsewhere seem to be monuments of oblivion, not remembrance – they designate spots to be avoided, not visited, unless by the idle curiosity of strangers; here they seem built up with the heart as well as with the hands; -- they are hallowed by the frequent presence of sorrowing survivors, who, by various devices of ingenious and elegant offerings, still testify their grief and their respect for the departed, and keep up by these pious visitings a sort of holy communion between the living and the dead. 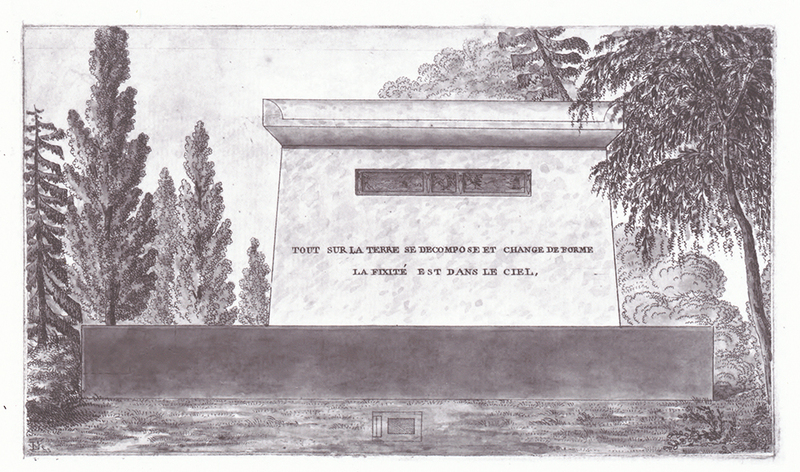 Never, never shall I forget the solemn, yet sweet and soothing emotions that thrilled my bosom at the first visit to Pere La Chaise. Women were in attendance as we approached the gate, offering for sale elegant crowns, crosses, and wreaths of orange blossom, xereanthemum, amaranth, and other everlasting flowers, which the mourning relatives and friends are accustomed to suspend upon the monument, or throw down upon the grave, or entwine among the shrubs with which every enclosure is decorated. Congratulating myself that I had no such melancholy office to perform, I passed into this vast sanctuary of the dead, and found myself in a variegated and wide-spreading garden, consisting of hill and dale, redolent with flowers, and thickly planted with luxuriant shrubs and trees, from the midst of which monumental stones, columns, obelisks, pyramids, and temples shot up in such profusion that I was undecided which path to explore first, and stood some time in silent contemplation of the whole scene, which occupies a space of from sixty to eighty acres. A lofty Gothic monument on the right first claimed my attention, and on approaching it I found that it contained the tomb in which are the ashes of Abelard and Eloiosa, united at last in death, but even then denied that rest and repose to which they were strangers in their unhappy and passionate lives. 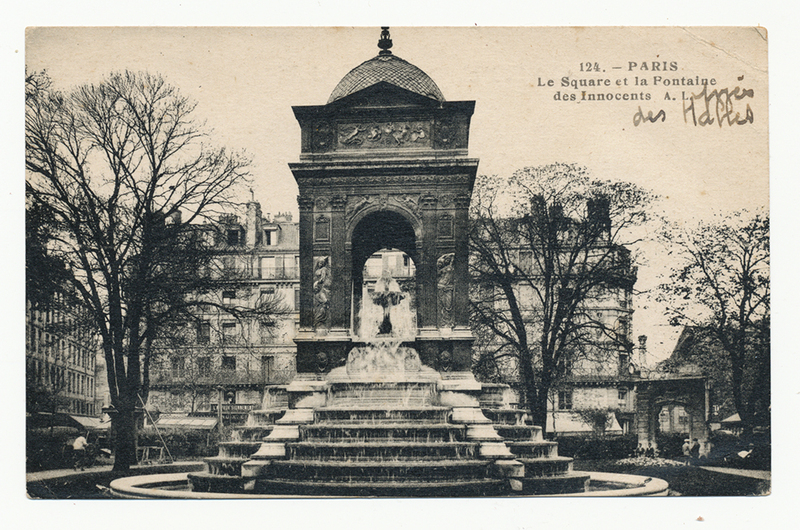 Interred, after various removals, at Soissons, in the year 1120, they were transported in the year eight of the Republic from Chalons sur Saone to the Museum of French Monuments at Paris, and thence to the romantic spot which they at present occupy. We learn from the inscription, that with all his talents Abelard could not comprehend the doctrine of the Trinity, and on this account incurred the censure of  contemporary hierarchs. Subsequently, however, he seems to have seen the wisdom of a more accommodating faith; and having evinced his orthodoxy by the irrefutable argument of causing three figures to be sculptured upon one stone, which is still visible, being let into the side of his tomb, he was restored to confidence and protection of the church. I have seen at Paris the dilapidated house in which he is stated to have resided; and now to be standing above the very dust which once contributed to form the fine intellect and throbbing hearts of these celebrated lovers, seemed to be an annihilation of intervening centuries, throwing the mind back to that remote period when Eliosa from the “deep solitudes and awful cells” of her convent edited those love—breathing epistles which have spread through the world the fame of her unhappy attachment. In ascending the hill extensive family vaults are seen, excavated in its side in the style of the ancients, with numerous recesses for coffins, the whole enclosed by bronze gates of exquisite taste and workmanship, through which might be seen the chairs for those who wish to shut themselves up and meditate in the sepulcher which they are permanently to occupy; while the yellow wreath upon the ground, or coffin, pointed out the latest occupant of the chamber of death. Some well-known name was perpetually presenting itself to our notice. 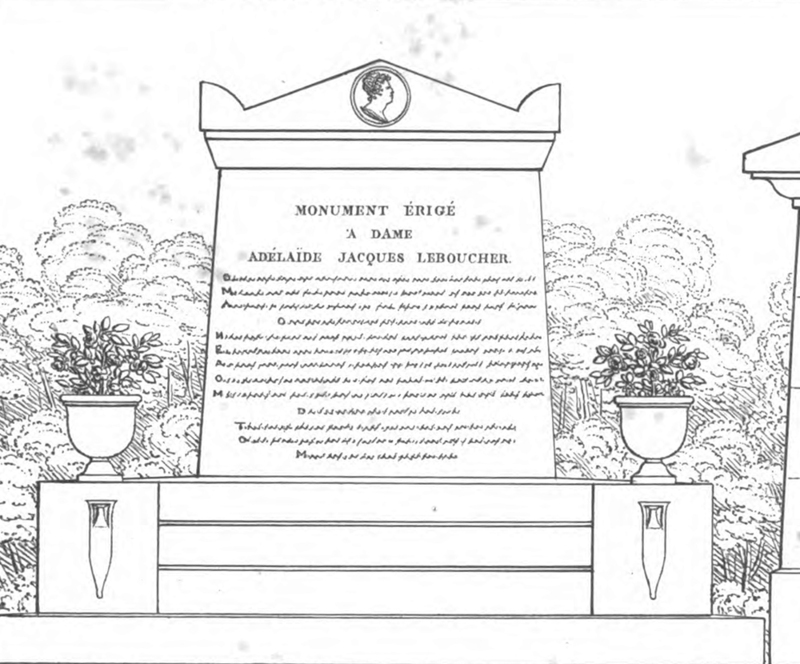 In one place we encountered the tomb of the unfortunate Laboydere, who was the first to join Napoleon when he advanced to Grenoble in 1815, and expiated his offence with his life. 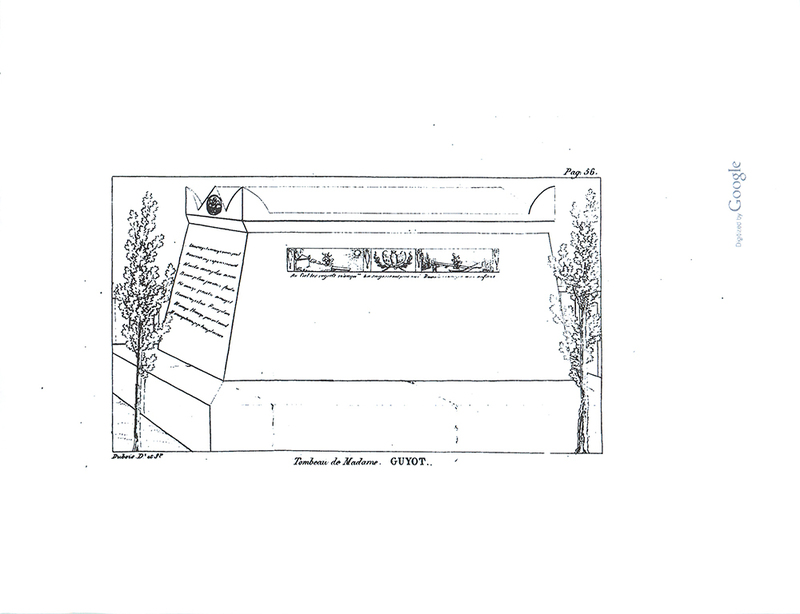 The spot in which the hapless Ney was deposited was shown to us, but his monument  has been removed. A lofty and elegant pyramid on the height bore the name of the celebrated Massena; and as we roamed about, we trod over the remains of republicans, royalists, marshals, demagogues, liberals, ultras, and many of the victors and victims of the Revolution, whose exploits and sufferings have filled our gazettes, and been familiar in our mouths for the last twenty or thirty years. 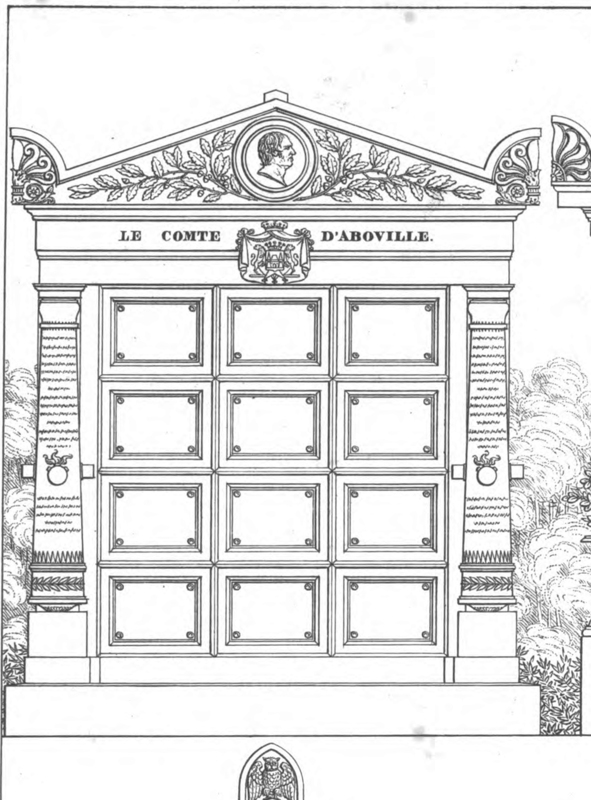 A few steps more brought us to the summit of the hill, commanding a noble view of Paris, the innumerable white buildings of which stood out with a panoramic and lucid sharpness in the deep blue of a cloudless sky, not a single wreath of smoke dimming the clearness of the view. Nothing was seen to move – a dead silence reigned around – the whole scene resembled a bright and tranquil painting. 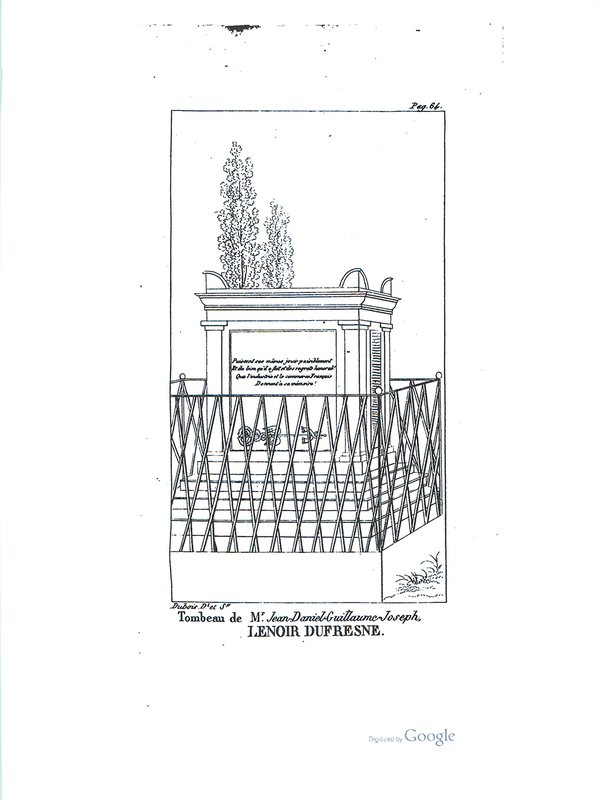 Not far from this spot is the tomb of the well-known authoress Madame Cottin, and monuments have also been lately erected to the memory of Lafontaine and Moliere. 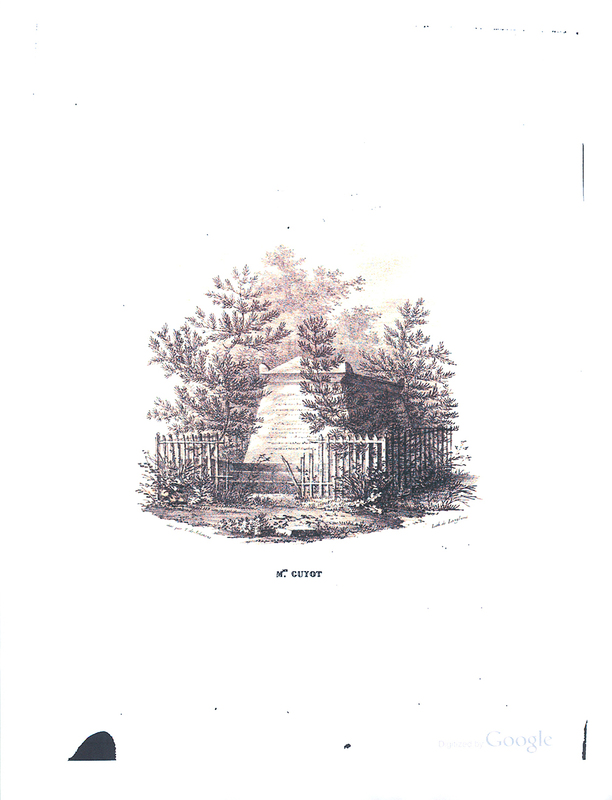 A low pyramid is the appropriate sepulcher of Volney; and at the extremity of a walk of trees, surrounded by a little garden, is the equally well adapted monument of Delille, the poet of the Gardens. 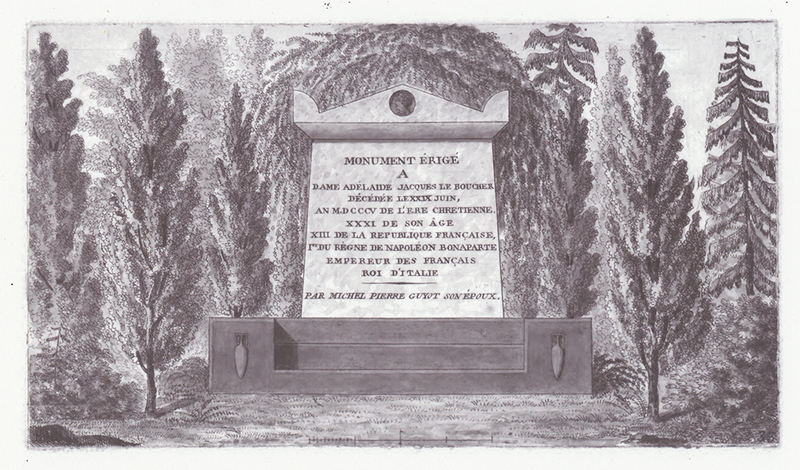 Mentelle and Fourcroy repose at a little distance and in the same vicinity, beneath a square tomb of white marble, decorated with a lyre, are deposited the remains of Gretry, the celebrated composer, whose bust I had the day before seen in the garden of the Hermitage art Montmorency, once occupied by Rousseau. How refreshing to turn from the costly and luxurious memorials of many who had been the torments and scourges of their time, to these classic shades, where sleep the benefactors of the world, men who have enlightened it by their wisdom, animated it by their gaiety, or soothed it by their delightful harmonies! Amid the tombs upon the heights a low enclosure, arched over at top to preserve it from the weather, but fenced at the sides with open wire-work, through which we observed that the whole interior surface was carefully overspread with moss, and strewed with fresh gathered white flowers, which also expanded their fragrance from vases of white porcelain, the whole arranged with exquisite neatness and care. There was no name or record but the following simple and pathetic inscription: “Fille Cherie – avec toi mes beaux jours sont passes! 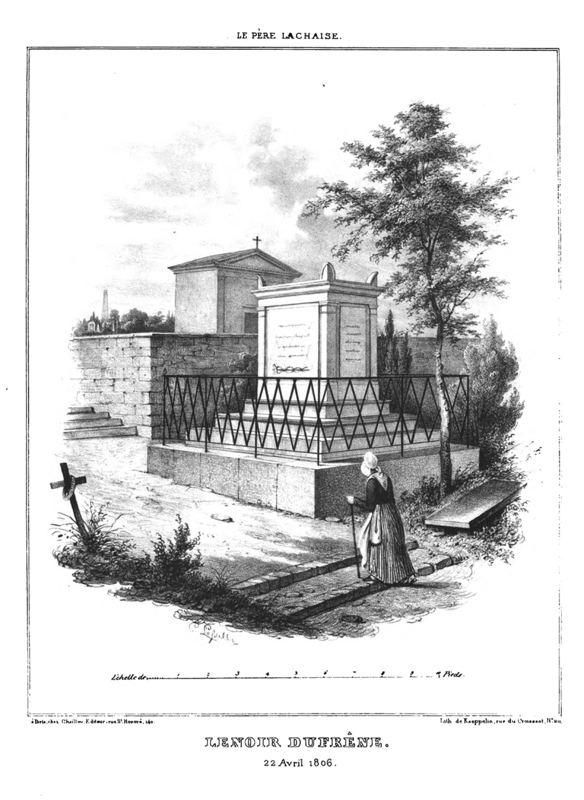 5 Juin, 1819.” Above two years had elapsed since the erection of this tomb, yet whenever I subsequently visited it, which I sometimes did at an early hour, the wakeful and unwearied solicitude of maternal regret had preceded me; the moss was newly laid, the flowers appeared to be just plucked, the vases shone with unsullied whiteness, as if even the dew had been carefully wiped off. How keen and intense must have  been that affection which could so long survive its object, and gather fresh force even from the energy of despair! An inscription to the memory of Eleanor MacGowan, a Scotch-woman recalled to mind the touching lines of Pope – “by foreign hands, etc.” but though we might admire the characteristic nationality, we could hardly applaud the taste which had planted this grave, as well as some others of her countrymen, with thistles. English names often startled us as we walked through the alleys of tomb-stones; and it as gratifying to find that even from these, the coarse and clumsy, though established emblems of the death’s head and marrow bones had been discarded. Obtuse, indeed must be those faculties which need such repulsive bone-writing to explain to them the perishableness of humanity. 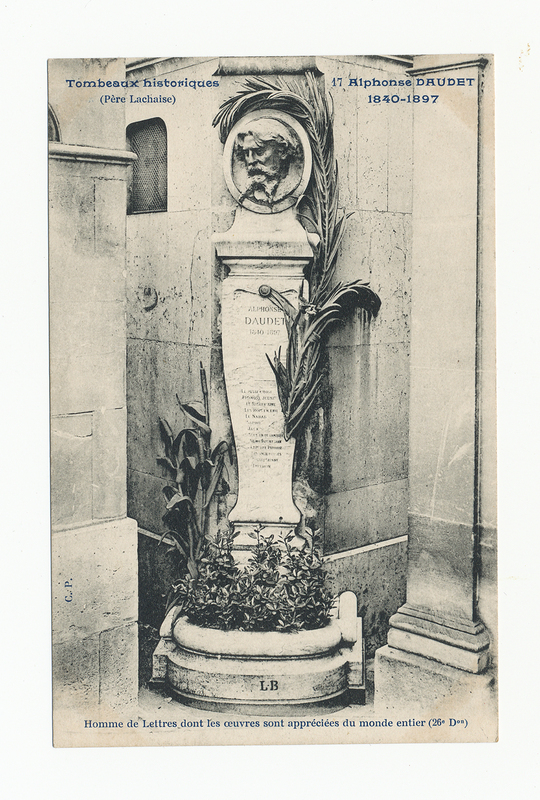 We nowhere encountered any of the miserable doggerel which defaces our graves in England, under the abused name of poetry; and, in fact, poetic inscriptions of any sort were extremely rare. 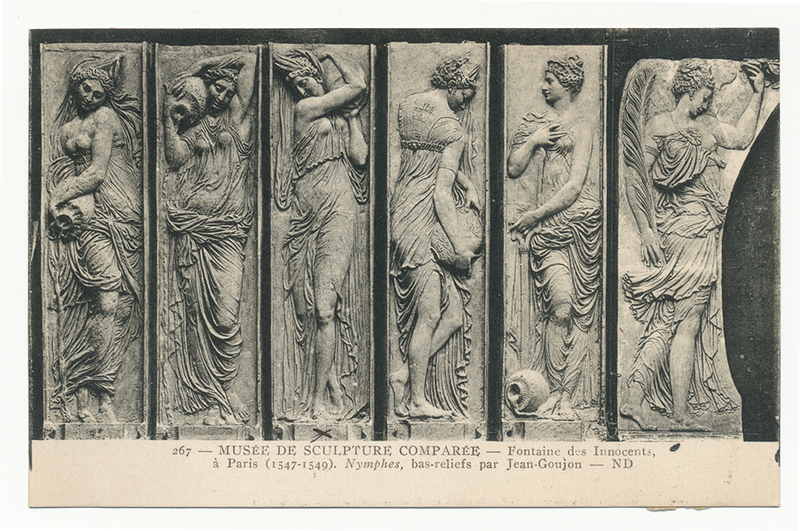 Some may assign this to the want of poetical genius in the French, but it might be certainly more charitable, and possibly more just, to attribute it to the sincerity of their regrets; for I doubt whether the lacerated bosom, in the first burst of its grief, has ever any disposition to dally with the Muses. A softened heart may seek solace in such effusions, but not an agonized one. Some rhyming epitaphs were, however visible. 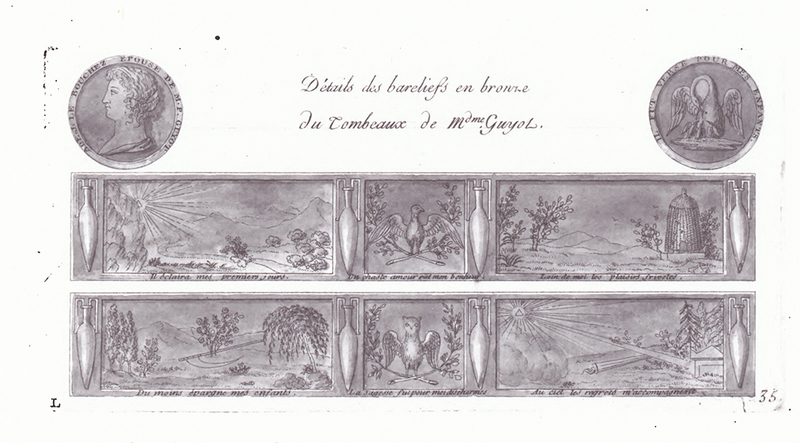 Under the name of the well known Regnault de St. Jean d’Angely these lines were inscribed. And a very handsome monument to the memory of an artist, in bronze and gold, named Ravrio, informs us that he was the author also of numerous fugitive pieces, to prevent his following which into oblivion, his bust, well executed in bronze, surmounts his tomb; and the following verses give us a little insight into his character. As I stood upon the hill, I saw a funeral procession slowly winding amid the trees and avenues below. Its distant effect was impressive, but, as it approached, it appeared to be strikingly deficient in that well-appointed and consistent solemnity by which the same ceremony is uniformly distinguished in England. The hearse was dirty and shabby, the mourning coaches as bad, the horses and harness worse; the coachmen in their rusty coats and cocked hats seemed to be a compound of paupers and old clothesmen; the dress of the priests had an appearance at once mean and ludicrous; the coffin was an unpainted deal box; the grave was hardly four feet deep, and the whole service was performed in a careless and unimpressive manner. Yet this was a funeral of a substantial tradesman, followed by a respectable train of mourners. Here was all the external observance, perhaps, that reason requires; but where our associations have been made conversant with a more scrupulous and dignified treatment, it is difficult to reconcile ourselves to such a slovenly mode of interment, although it may be the established system of the country. All the funerals here are in the hands of a company, who, for the privilege of burying the rich at fixed prices, contract to inhume all the poor for nothing. It is hardly to be supposed, that in such a multiplicity of tomb there are not some offensive to good taste. Many are gaudy and fantastical, dressed up with paltry figures of the Virgin and Child, and those tin and tinsel decorations which the rich in faith and poor pocket are apt to set up in Roman Catholic countries – but the generality are of a much nobler order, and I defy any candid traveler to spend a morning in the Cemetery of Pere La Chaise without feeling a higher respect for the French character, and forming a more pleasing estimate of human nature in general. 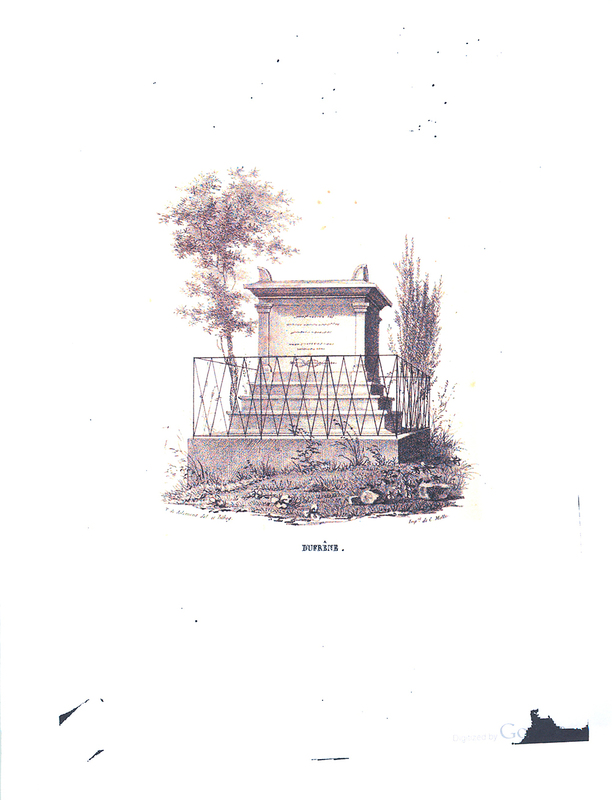 Work on your French while you listen to Caroline talking about Pere-Lachaise. 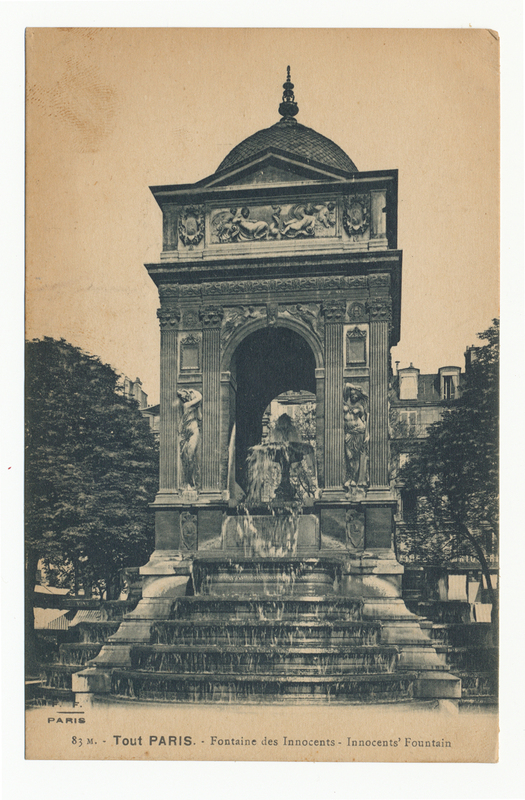 This fountain is last remnant of the cemetery that was once beneath what would become Les Halles market. The market was torn down in the early 1970s to make way for an incredibly tacky underground shopping mall.